I was in a rush this morning and pretty much forgot all about breakfast. I’m not much of a breakfast eater during the week but I usually force myself to at least eat some cereal and yogurt by 10 a.m. But when I came home today at lunchtime, I realized that I hadn’t eaten anything at all. I wanted something quick and filling but not too heavy and the first thing that came to mind was eggs. It’s when I’m hungry that I get creative in the kitchen. I don’t want to spend the time searching through recipes and my growling stomach doesn’t give me time to “overthink” what I’m throwing together, it’s more intuitive. So today, this omelette recipe just kind of happened. Luckily, It turned out really, really good and I’ll definitely be making it again! 1. In a small bowl, beat the eggs, sour cream, and water with a fork until well blended. Stir in chives, a pinch of salt some some fresh ground pepper. 2. Heat a nonstick skilled (8 or 10 inches) over medium heat. Add butter and swirl around. Pour egg mixture into pan and cook until the top is almost set. Gently loosen omelet and carefully flip it over in the pan. Sprinkle cheddar on one half and gently fold the omelet over the cheese. Serve immediately. 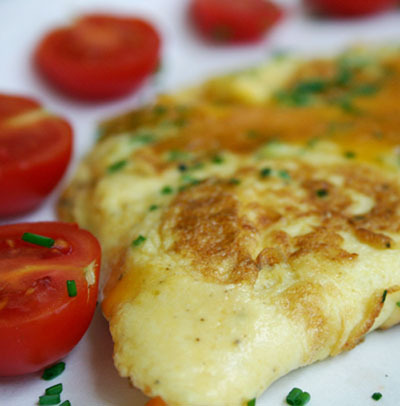 I love omlettes and that one looks really amazing! This is going to be my lunch today. Just have to zip out to the garden for the chives! Yum! I love simple omelets. I like them simple too...the chives add that extra "something" but aren't overpowering and if you use the extra sharp cheddar, you can get away with a very small amount of cheese since it's so flavorful. Sounds like a good idea. I got to get into my chives. This was so delicious. A friend told me about your website and it is awesome. Wonderful recipes and superb pictures. Absolutely love seeing the pictures. Thanks so much for a great website and wonderful recipes. Darlene, lurking from Nova Scotia, Canada. This looks so tasty, I can't wait to try it. You can never go wrong with sour cream and chives. Another good sour cream/chive breakfast option is sour cream and chive waffles. Thanks for this, I'm going to try it out this weekend!